Now that this wine has had a few months in bottle it is really beginning to show its stuff. With a beautiful strawberry aroma, and full rich, complex and concentrated flavors, this rose, were you to taste it blindfolded, could easily be confused with a delicious lighter bodied red wine. Like all our wines, we put our every effort into it to produce the best. 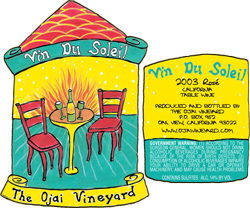 Made from syrah, mourvedre, grenache, and pinot noir-the juice was fermented and aged in older French oak barrels, and then was bottled in late March to preserve its freshness and vibrancy. This character filled wine is a great match for luncheon foods from Texas style BBQ to Mexican food, and makes a wonderful aperitif to boot.